I distressed the edges of the tag, then went over with Walnut Stain Distress Ink. Cut out a piece of the collage paper she'd sent, big enough to cover where the acetate bubble containing the flowers had been: did the edges with Walnut Stain as well. Added a postage stamp and a jewel and pearl flourish. Stamped one of the sayings from the set Karelyn sent me in a Secret Santa, distressed it and stuck it over where it said 'Graphic 45'. Stuck a set of the flowers over where it said 'Flowers' and added a piece of the ribbon that came with the banners. 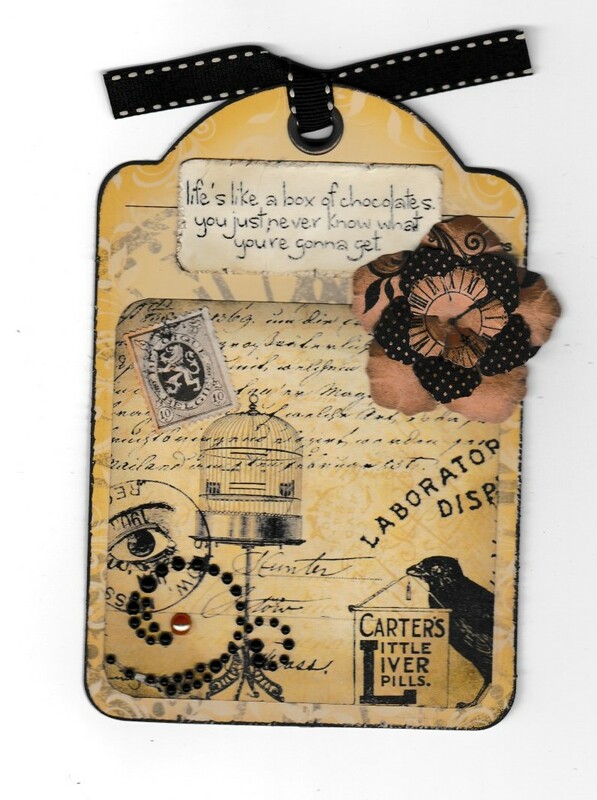 On the back, I stuck some more collage paper over the printed bits and pieces, then stamped 'Thankyou' on a distressed piece of the same card as the front stamp - which doesn't actually look as different as the background behind it when you see it IRL. Lovely, bet she will be thrilled when she sees it. loving the clock face flower centre, and the quote of course. What a lovely thing to receive, she'' be impressed.